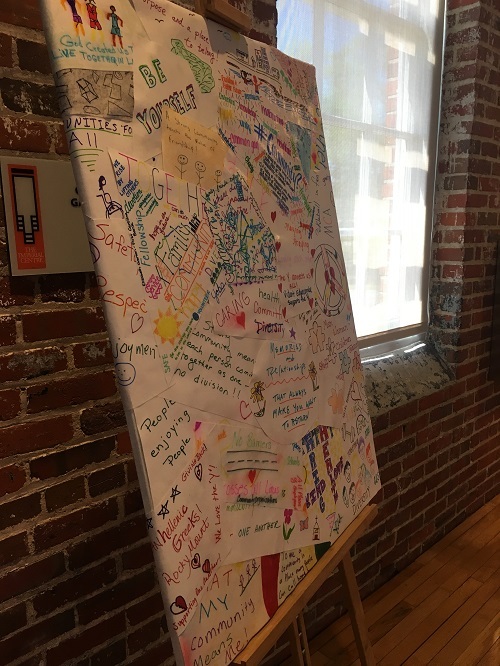 On March 28th, The Harrison Family YMCA staff, Board of Directors, Campaign Volunteer Storytellers, YMCA Members, and other community members kicked off the community phase of the Y’s 2019 annual support campaign. This campaign is here to ensure that everyone in the area has access to vital community programs and resources that support youth development, healthy living and social responsibility. 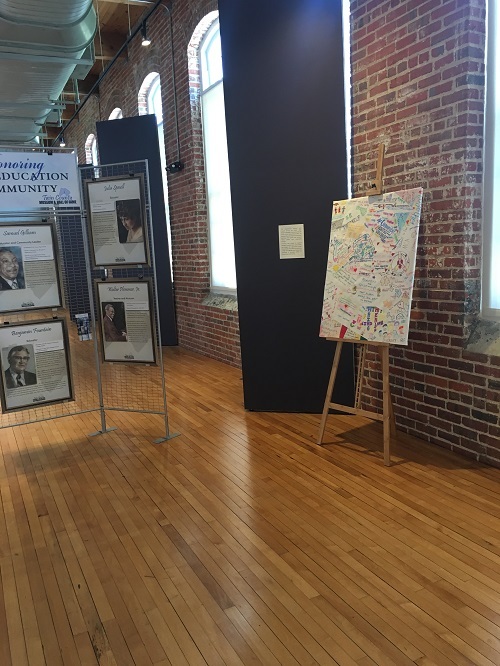 The kickoff was open to the community and held at the Rocky Mount Mills. The YMCA’s Marketing & Development Director posed a question to the audience to encourage everyone to think about this community and how the YMCA plays a part in that to them. 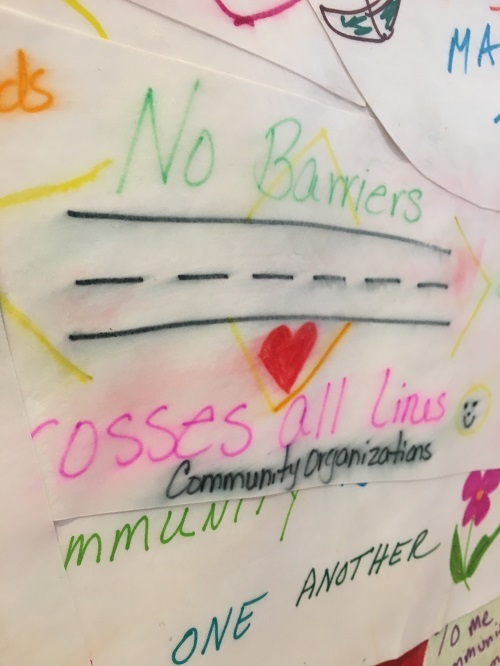 The question was, “What does a strong community look like to you?” This question translated into an art piece by asking the audience to draw this out visually on a shape. Those shapes were then placed into a collage, thanks to instructor assistance by Imperial Center artists. 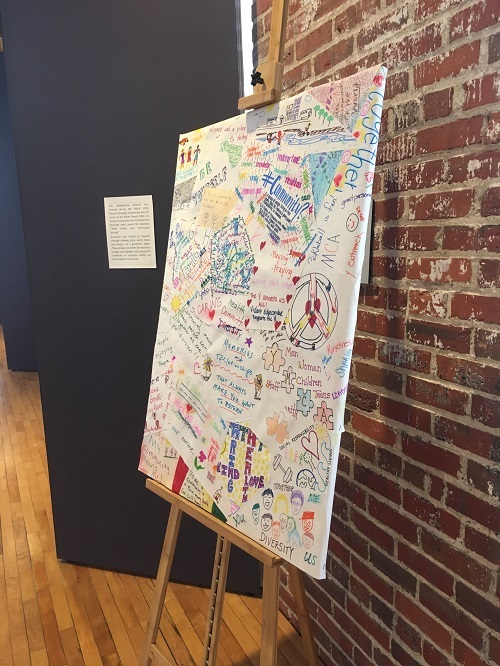 This canvas collage is now located in the Imperial Center’s Community Gallery during the month of April and will then be located at the YMCA. 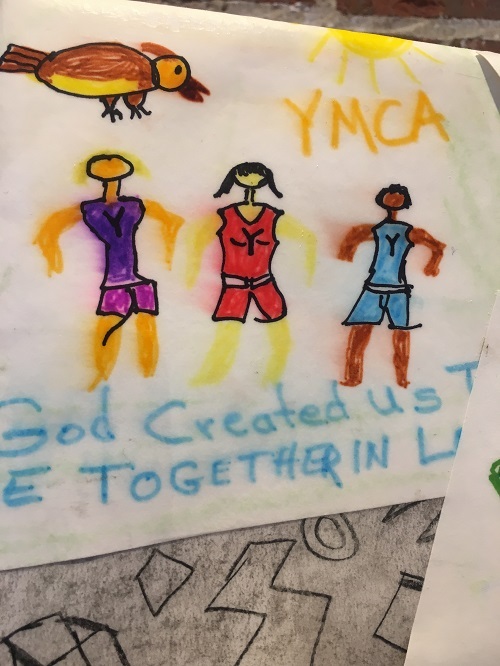 This serves as a symbol and reminder of the YMCA’s cause to connect and strengthen our community together, for all. YMCA annual campaign donors make it possible for children, families, and adults to have access to Y programs that improve their lives. 100% of the funds raised are used to provide financial assistance in the form of full and partial scholarships, based on individual need, as well as outreach programs, which are then made available to participants at little or no charge. Changing lives, piece by piece. That is the campaign’s theme this year. For many families, “healthy living” seems unattainable due to finances. For dozens of seniors, “community” may be an unfulfilled desire. For hundreds of youth, a safe space to play isn’t available for them. 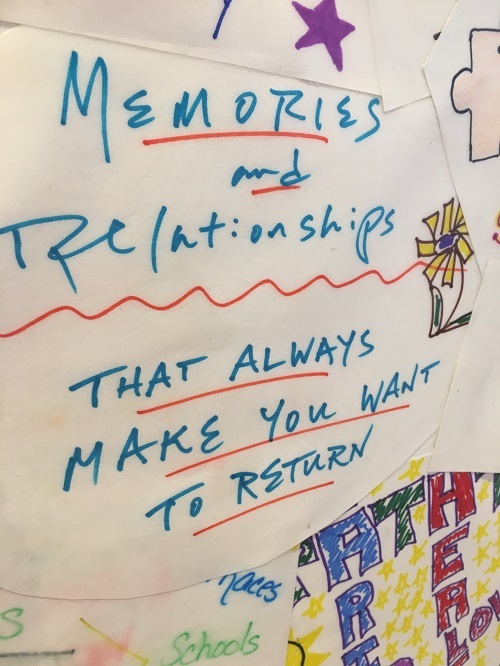 These are the “pieces” that are vital to a healthy, confident, connected community. At the Y, we believe all people deserve a chance to reach their full potential, regardless of financial means – but we can’t do it on our own. We are all a piece to the puzzle. 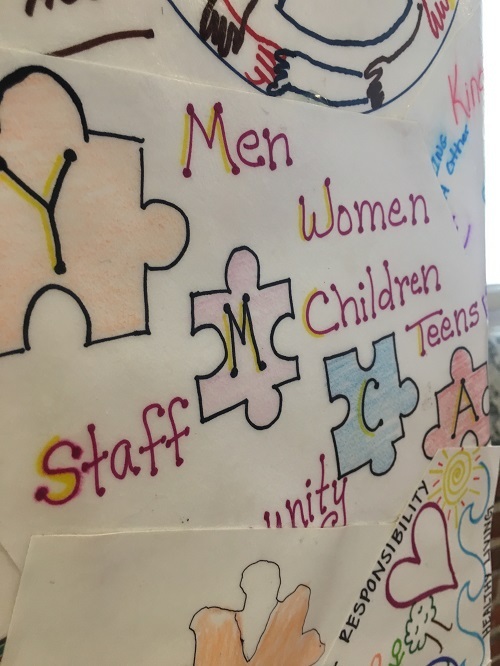 Donate today and help us piece together the big picture. The Harrison Family YMCA hopes to raise $120,000 for the 2019 annual support campaign. So far, they are already at 75%! You can donate online at harrisonfamilyy.org or grab a pledge card from the front desk at the YMCA on 1000 Independence Drive in Rocky Mount, NC. 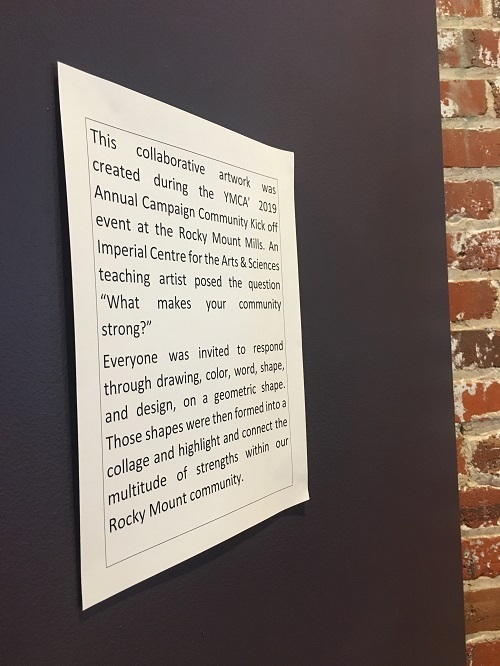 To learn more about how you can support the Y’s cause, please contact Alyssa Matthews, Marketing & Development Director at marketing@rmymca.org or 252-972-9622.